Well it is 2019 and the sun has started to peek itself through the rain and grey that is the British weather. As it is almost civil to be out on a bike here is an update. I did not get a place. My workmate got a place. My workmate has never ridden a bike – let alone 100 miles. I am now riding Ridelondon 2019 for charity, helping my friend round the 100 mile course. Yes we are back !! Whats happening people ? Yes we are all a year older and hopefully we are still riding bicycles. So whats been going on I hear you ask ?. Yes I am stupidly Riding London again !. Alas I did not get into the ballot this year. I must stop myself from “signing up” in the warm glow of completing the event. Its so easy to forget how many hours on the bike you need to get ready to “enjoy” rather than “endure” the event. I was contacted by my local small charity.. Revitalise and decided to push the bike out and ride one more time for them. If you would like to sponsor me for a great cause.. that would be fantastic. The weather has been horrendous so far this year, and I am getting old enough to not enjoy banging my head in the freezing hail / snow / ice. So time on the actual bike has been limited so far. I have clocked up some time in the gym instead. I sort of forgot I had entered the ballot last year, so when a strange magazine arrived this morning I opened it up. And so it begins again… 5th time round. Now where did I put the bike ?. I better get organised, I am getting too old for all this. 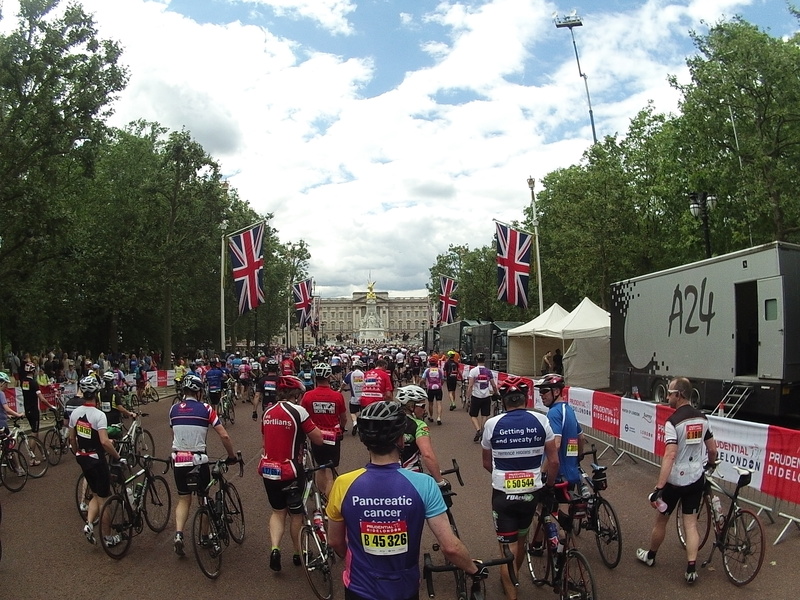 Ridelondon weekend has come round again…. lets do this. The problem this year was I probably peaked too early, off the back of the JOGLE, one hundred miles would be a simple cycle in the park. Of course I had not really been on the bike too much since getting off in Lands End, just a few 60km outings. Got the train up to London saturday afternoon, and straight onto the closed roads at Waterloo bridge, and around the freecycle loop. Great to see so many out and enjoying the center of town with no traffic. After a few loops of London I stocked up on carbs (massive pizza) and got an early night. Alarm went of at 4ish and I threw some food down me and cycled off to the start. Weather forecast was looking good, although it was a pretty cold waiting in the starting pens at 5:30am. Felt pretty good all the way round (I didn’t try anything heroic this time) Saw some pretty hornendous crashes so the main aim was to stay safe. I know the roads well so was well aware of the danger points, but a lot of people seemed to risking a lot to get round fast. I got some cramp at the end (about 5 miles to go) and had to stretch out. The weather had warmed up and it was tricky to take on enough water / electrolytes. Stopping at some of the stations can be a nightmare if they are crowded and the tempation is just to cycle on. Finished in a respectable time of 5 hours 28 mins… so was very happy with that. And here is a great flyby of the ride…. 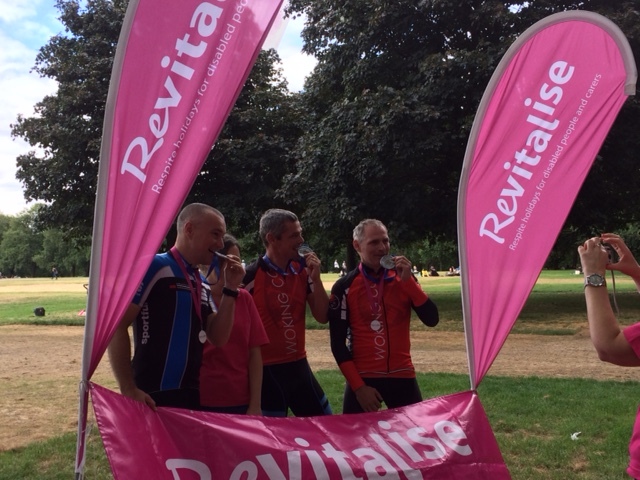 Afterwards I met up with the lovely people at Revitalise …. who furnished me with the best donut and beer EVER !!!!! I will definately be riding for them again… when I get the chance.